Make your classic style shine through with vintage crockery. We are a huge fan of Pinterest at Plum Honeychurch. I’m sure you won’t be surprised to know we have our own Pinterest page with lots of our own images pinned as well as great ideas from other “pinners”. (I’m not sure if that’s what they’re called but it sounds good). If you search for “vintage crockery” on Pinterest you will see some lovely decoration ideas you can use for your family china. If you are arranging a wedding or event and you’re stuck for a theme for your table centrepieces or place holders, there are some beautiful ideas to create a British country garden styled look that takes you straight back to a Merchant Ivory Film. At a recent wedding I worked, the Bride had designed an eclectic selection of teacups and saucers for each guests place setting with a parcel label tide to the cups handle, which displayed the guests name and then a little hessian bag containing the wedding favour in the middle of the cup. It was a charming way to dress the table and it also meant everyone had a beautiful cup to drink their tea or coffee from at the end of the meal. Using teapots or teacups to hold flowers is a wonderful way to create an atmosphere of long summer days with poise and grace. 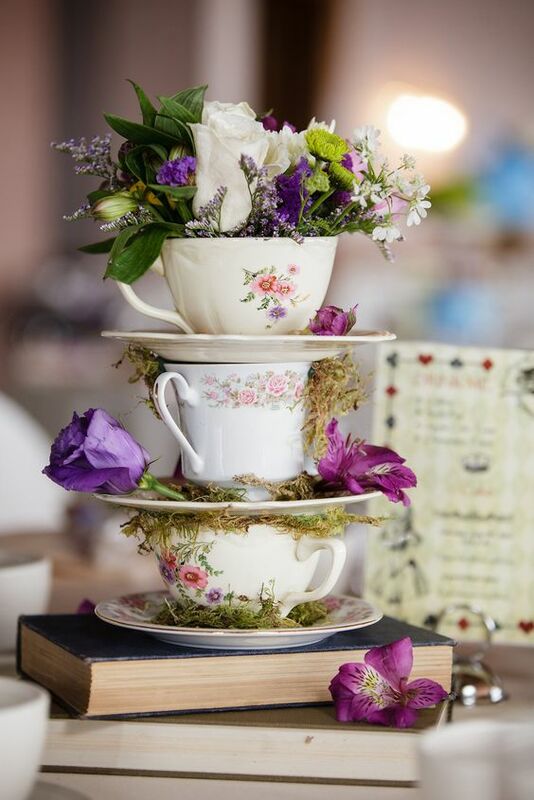 Three teacups and saucers placed on a couple of antique leather bound books, with a small posy of fragrant flowers in the top cup, forms an eye catching image for a table decoration. 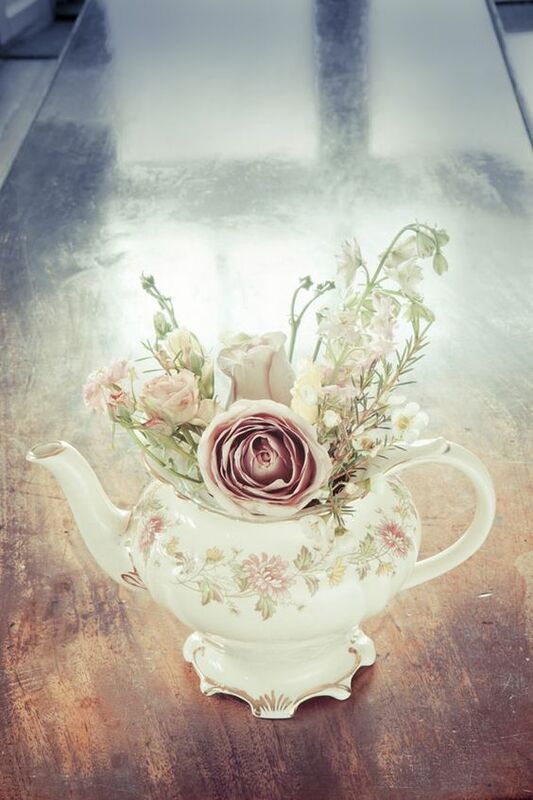 Alternatively, you can keep things simple with a teapot filled with wild flowers. If you have some family china wrapped up in old newspaper in the loft this is a great way to include some family history in the day. Don’t worry if you don’t have enough to design the look you want, we are happy to hire specific items. 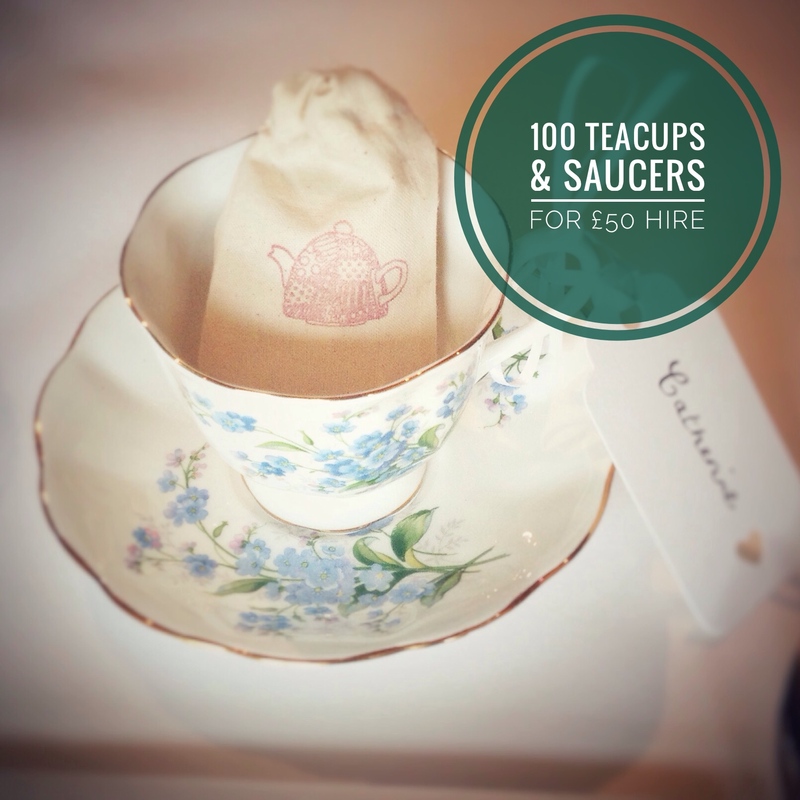 So if you just want 50 teacups and saucers or ten teapots, we would be more than happy to hire them to you. Hire our vintage crockery: take advantage of our current offer of 100 teacups and saucers for just £50! Interested in hiring our vintage crockery for your event? Please give us a call on 07879 844183 or drop us an email using our contact form.